The eye works very much like an old style camera. The front of the eye, comprising the cornea, iris, pupil and lens focuses the image onto the retina, which lines the back of the eye. The retina is sensitive to light and acts like the film in the camera, capturing images and then sending them via the optic nerve to the brain, where images are interpreted. 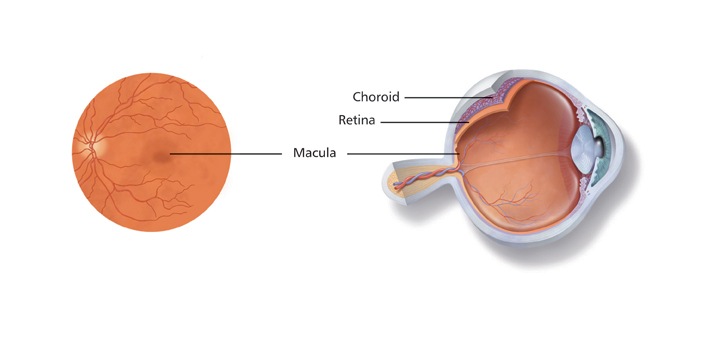 The macula is the name given to the area at the very centre of the retina. This region is responsible for detailed central vision and most colour vision. It is responsible for the ability to read, recognize faces, drive a car, see colours clearly and any other activity that requires fine vision. The rest of the retina is called the peripheral retina. It is used to see general shapes and provides 'get-about' vision which is also called side vision and peripheral vision.